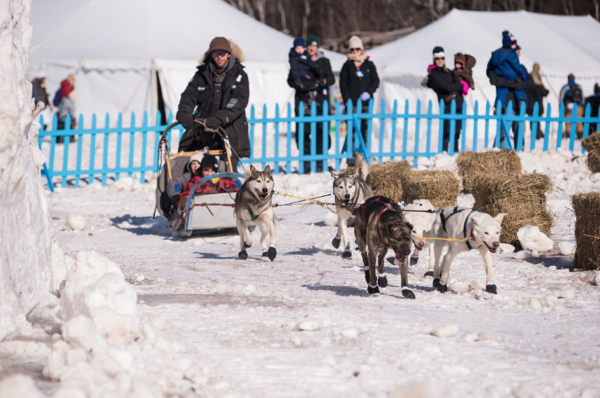 Mitten Thumbs Up for Friendly FROSTival: Shelley Cameron-McCarron's snapshot of Atlantic Canada's largest winter fest. *Editor’s note: On the eve of Fredericton’s annual FROSTival (Jan 19-Feb 12, 2017) we bring you a post from travel writer Shelley Cameron-McCarron who recently packed up her husband and three children in Nova Scotia and hit the road in pursuit of some frozen New Brunswick fun. 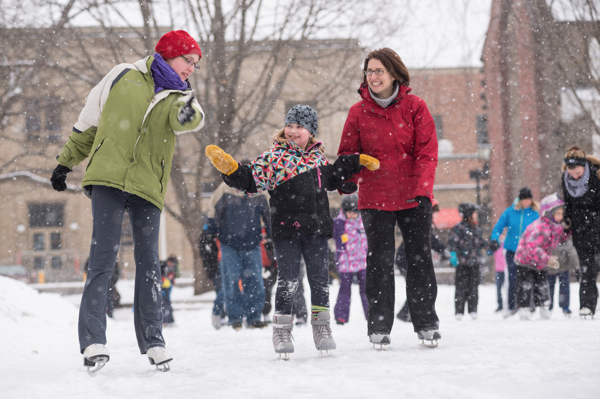 As young kids and teens and grandparents blur by—all spins and skates and smiles—I realize I’ve been doing winter all wrong. Down below, I’m humming and swaying and feeling good about life as I watch my rosy-cheeked offspring wave and zip by on the outdoor public rink in the city’s Historic Garrison District—where a free old-fashioned skating party takes centre stage in Officers’ Square. Volunteers pass out cookies as big as Buicks, and steaming cider and cocoa come with cupfuls of community pride. “Down by the riverside…” breezes from the balcony, my daughter has asked if she can skate another round, and I’m thankful I didn’t kibosh the ambitious, four-hour winter drive to New Brunswick from our home base near Antigonish, Nova Scotia. “It’s meant to be an expression of community passion for winter,” says Fredericton Tourism manager David Seabrook of FROSTival. Already the four-weekend celebration of food, culture and outdoor activity has exceeded expectations. Just three years old, it’s grown from 60 events to over 100, most of which are free. And it’s convinced me, someone who typically avoids winter weather at all costs, to embrace my inner snowman. Here are six memorable moments from Atlantic Canada’s largest winter celebration. “Look, moose tracks!” shouts my husband on our first night in town as we snowshoe around Mactaquac Provincial Park—a gorgeous nature reserve featuring beaches, golfing and camping facilities, beaver ponds and walking trails located just 20 minutes from Fredericton. We’re tromping around out in the crisp night air seeking marked coordinates on a “Moonlight Snowshoe Scavenger Hunt” so we can “sink” a battleship back at the park lodge, where earlier we enjoyed pan-fried New Brunswick smelt and blackened scallops in front of a roaring fire. My young family and I visit Ducks Unlimited Conservation Centre, located on the north banks of the St. John River. Here, we spend an hour engrossed in assembling a cleverly designed wood duck nesting box. Bonus: The kids get to use power tools and we get to take the nesting box home with us as a souvenir. This creative use of community assets is one of FROSTival’s biggest draws. 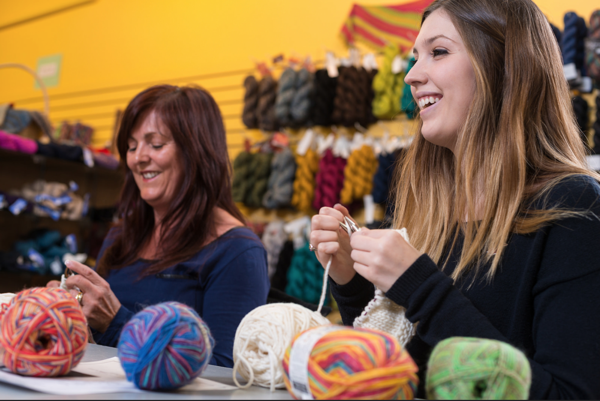 Everyone has something on offer: an adult science night at Science East; craft workshops in the New Brunswick College of Craft and Design; and family art exploration at the Beaverbrook Art Gallery. Snow falls gently as we head to Officers’ Square to snag front-row camp chairs for “Shivering Songs By the Fire” with Owen Steel. 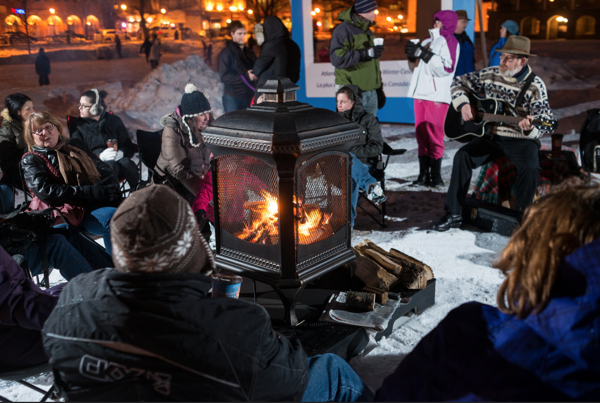 For each of the festival’s four Saturday nights, a musician entertains outdoors by the fire. Steel’s soulful songs fill the air as skaters glide by on the rink behind us. A community group offers hot chocolate and cookies by donation for the local food bank. And the Fredericton lighthouse, which is perched on the banks of the St. John River, offers a picturesque backdrop. In Fredericton, people converse with you in stores, as you wait on sidewalks for stop lights to turn, and as you browse the farmers’ market. As relatively chatty Maritimers ourselves, we even noted how warm and welcoming people are. As well, New Brunswick’s provincial capital, home to over 50,000 people, is easy to navigate, by car and by foot. It takes no time at all to amble from our base at the Crown Plaza Lord Beaverbrook Hotel—past dining and shopping options along the way—to Officers’ Square where all the action is. “You going to be able to eat all that?” laughs a man at our communal table as my eight-year-old tucks into her brunch plate heaped with eggs, bacon, sausage, toast and home fries. Maritimers love a good scoff and a kitchen party and the Bluegrass Brunch delivers both. Hello breakfast ceilidh! Held the first Sunday of the fabulously curated Shivering Songs Music Festival (which attracts a loyal crowd), the popular brunch at the Boyce Farmers Market, is a tradition. We find seats as Alan Jeffries and 50 Shades of Blue take the stage and hearty conversation fills the air. Those inclined (my husband) can try the very good local Picaroons Traditional Ale brewed, of course, just a few streets over. With so much on tap, deciding what to do may be your biggest challenge when you come. As for my FROSTival? I must have done something right. As we pull out of town and head home to Nova Scotia, I’m warmed by thoughts of time well spent—with my husband and children, with nature and with our welcoming New Brunswick hosts. ***Writer Shelley Cameron-McCarron was a guest of Tourism New Brunswick and Fredericton Tourism. They did not review or edit her story before publication. I visited Fredericton in the summer and it surprised me how much I liked it! OK, I *was* there for the Highland Games which was really fun but I would have enjoyed the visit even without so much plaid. Now I’ve got to visit in the winter!